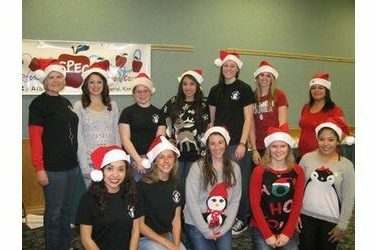 Saints Promoting Education Careers (SPEC) hosted an evening of holiday stories, games and snacks for local children ages Kindergarten-third grade Friday, Dec. 4 at Seward County Community College/Area Technical School. “We had about 30 kids and a number of parents come out for the evening and they enjoyed everything from making Christmas cards to listening to stories to sipping hot chocolate with their Christmas cookies,” said Janice Northerns, club sponsor. Club members read books aloud to the children, including “The Night Before Christmas.” “This is our fourth year to host this event, and it’s a perfect fit for our club of education majors since the focus of the evening is on reading,” Northerns said. For the first time, the club also gave a free book to each child this year. “The books were a big hit,” Northerns said. “A few of the kids had trouble making up their minds, but they were excited to choose a book to take home.” “Tis the Season for Reading” is one of several community service projects the club does throughout the year. Club president is Sheldynn Reynolds, vice president is Marissa Rodriguez, and Maricela Banuelos serves as secretary. Other members include Marcala Pewthers, Leslie Speer, Shania Liggett, Bibiana delhoyo, Erin Kate Richardson, Carol Brockmann, Ciaralena Perez, Axelle Bernard, Perla Camacho, Caileigh Alling, and Lesli Vasquez.